The tiny lane that I drive along (usually whilst humming the theme music from “All Creatures Great and Small”) bears virtually no traffic so, if I see something of interest, I can just stop. No indicating, no pulling over; just stop. 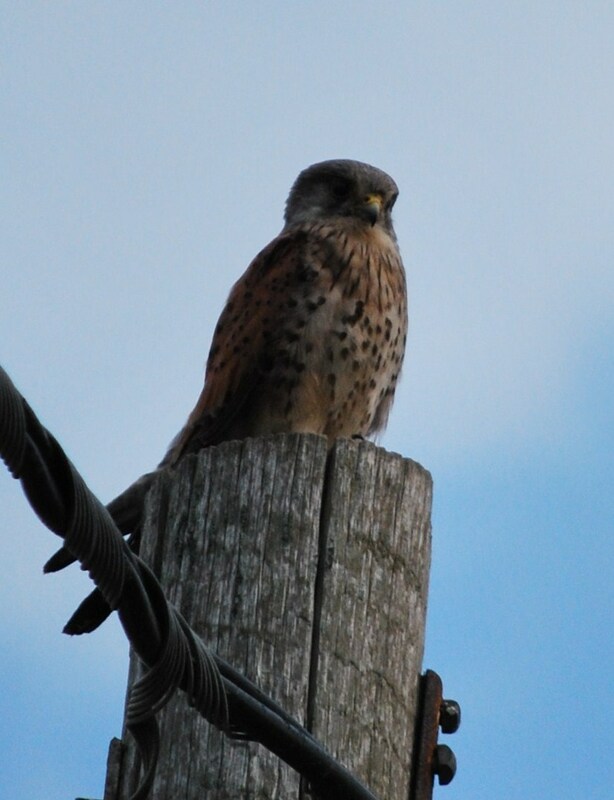 Which is what I did today – when I saw a kestrel. I leant out of my car window and looked up at him. And he looked down at me. I heard on the radio that kestrel numbers have declined recently, in possible correlation to the amazing success that buzzards now enjoy in southern England. Competition for prey? 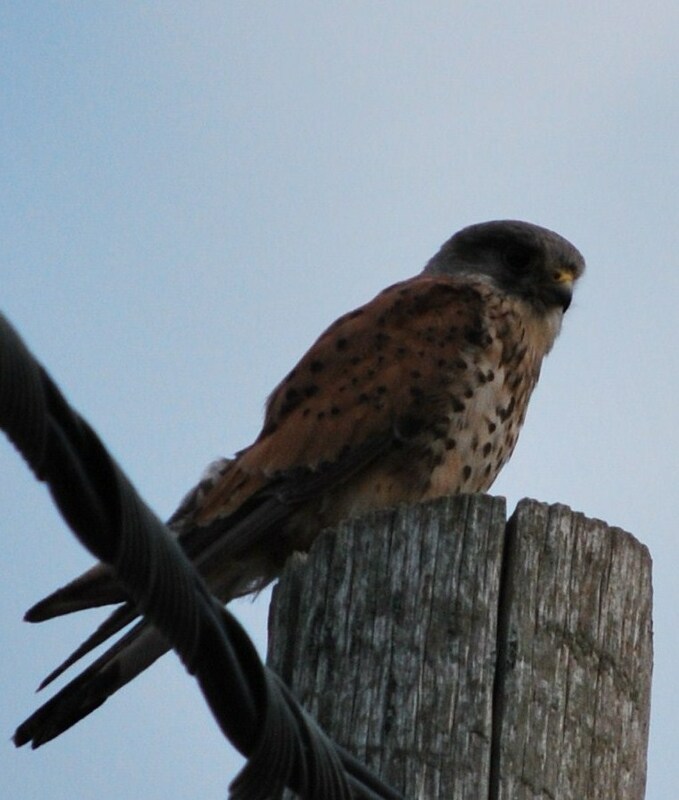 No one seems sure, though I certainly still see plenty of kestrels. As a boy though, I never saw a buzzard. Now, the plaintive mewing of them circling high in the sky (like a far distant, benevolent Nazgul) often keeps me company at the Priory. I looked at the kestrel a little longer. And he at me before, growing impatient to be up over the fields and along the hedgerows, he flew off. I put my camera away, wishing I’d had time for some better photos, started my car and resumed my humming. It's a great film, Trevor (and book too, 'A kestrel for a knave' – but then you knew that) and worth watching for the wonderful Brian Glover alone!! I was kept company by a pair of hunting kestrels one afternoon a few weeks back. Annoying really as I found it impossible to get on with my work; they were so fascinating to watch. And like you say motionless in flight! Nice post. I love Kestrels. They always remind me of the film Kes. Sad film but captures the boys childhood perfectly. We have a pair busy, busy, busy over our field. They obviously have young as they never stop hunting. Even in these strong winds they manage to remain motionless in the sky. Just incredible. Hi Faisal, doing this blog has really opened my eyes to what is going on about me – and given me a reason to photo it. Hi Janet, it's a great drive but if anything too short. 'Pretty but knowing' – would be a good tee shirt. Hi Kininvie, I watch buzzards circling overhead and often feel sorry for them as they're mobbed by crows or whatever. I hadn't thought of them as potentially picking my bones clean – until now. Hi Stacy, it is so beautiful thanks to some hard work by villagers in the forties and fifties who stopped the valley becoming one big housing development. Quite an achievement as so much of this stretch of Southern England is unimpeded bungalow-land. That drive sounds heavenly. It really does, and to have it all to yourself–or possibly to share it with kestrels–or even buzzards–or even less benevolent Nazgul–well, you've done well for yourself, Mr. Marsden. I'm not sure I think buzzards are benevolent. Sometimes I look up and there are two or three circling overhead like vultures – probably waiting for me to drop dead. Wonderful, I do love Kestrels, pretty but knowing. And rather deadly if you are a field mouse. Not a bad commute to work! How beautiful, David, to know the wild world is alive and well, in Sussex, or anywhere, despite the buzzards. I hope you'll show us alot more views from your journeys, for it's in stopping to look that makes all the haste and movement worthwhile.